Training for Kilimanjaro: The best information and preparation. 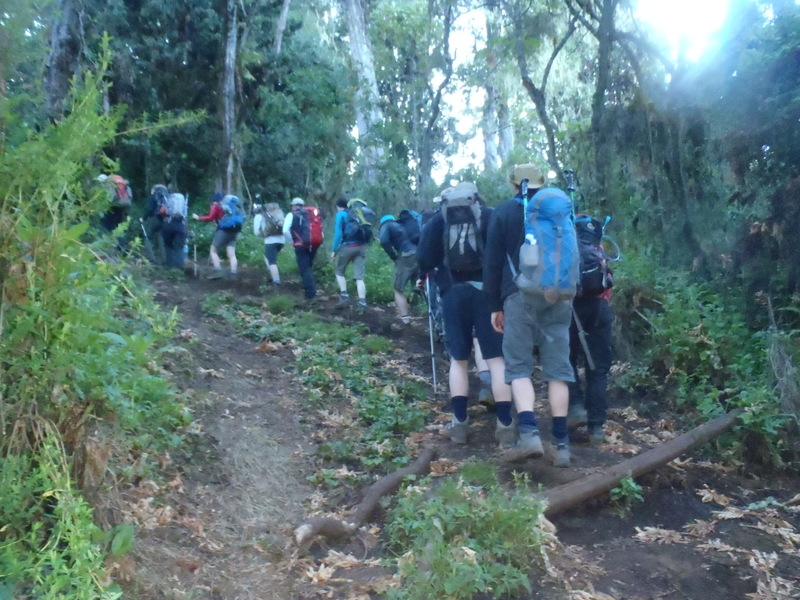 If you are signed up to an Ian Taylor Trekking climb you can contact Ian directly 5 days a week to get the best information for your Kilimanjaro climb. Ian has climbed Mt. Everest to the top and Kilimanjaro 30+ times. Join one of our teams. Physical Conditioning: Despite being a mountain which is accessible to most people and not just experienced mountaineers, Mount Kilimanjaro should not be underestimated. Especially the summit night on Mount Kilimanjaro. Hiking to its summit is a serious challenge which requires significant preparation and specific physical conditioning. Leg strength and endurance training are key to success. 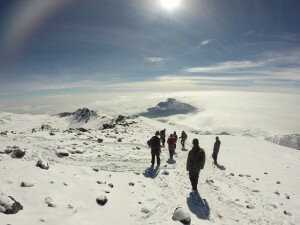 With forward planning, the right acclimatization schedule and the right attitude to training, you stand the best possible chance of successfully and safely getting to the top of Kilimanjaro and back down again – and enjoying one of the most rewarding and spectacular experiences in the world. This information is designed to help you in your preparation. 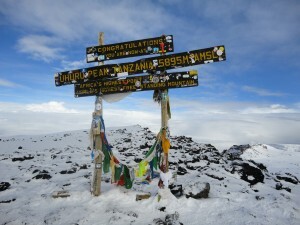 Ian has climbed Kilimanjaro 30+ times to date and available to help you prepare for your climb. I encourage you to read our blog post on our approach to summit night. This will help you understand the way you move to the summit. If you need to discuss how to fully prepare you need to CONTACT US as we can give your more specific training advice. We have the inside knowledge and it is always easier to talk specifically to your personal needs. We also want to make sure you have the right gear. Watch our Kilimanjaro packing video. If you need further information CONTACT US and we can help with you training, preparation and all aspects of the trip. CLICK HERE for top 10 tips for climbing Kilimanjaro. Training and Fitness: Climbing Mount Kilimanjaro is a physical challenge which is well within the reach of most people who enjoy a reasonable standard of fitness. However, training specifically for the climb is essential to prepare you for the particular pitfalls posed by mountain walking. You are strongly advised to seek medical advice before deciding to arrange your climb and before starting a training program, particularly if you have any concerns about your health. Remember the summit day is 14+ hours. 4,000 feet of ascent into extreme altitude and 9,000 foot drop in one day. This requires serious consideration. It is important to start training as early as possible before your scheduled climb. Building strength, fitness and stamina. The best physical preparation is activity which simulates, as far as possible, the demands on your body which will be happening during your ascent and descent of Kilimanjaro. In my opinion building endurance walking up and down hills, building up weight in your back pack is key to success. If you do not have access to hills you need to be using a stair master and treadmill to gain the required strength and endurance. I recommend training 6 to 10 hours per week. READ SOME REVIEWS. You should therefore aim to make walking up and down hills as the main part of your training. Taking regular and increasingly long walks will help develop the muscles which will be needed when you arrive in Africa. Try to find some local hills to walk up and down if possible. Gradually increasing the duration of your walks will help to develop your stamina and also assist in preparing you for being on your feet over long distances.You should also we walking and training during the week. When out on training walks, ensure that you always wear the boots you intend to take to Kilimanjaro. Getting used to your footwear will help make you as comfortable as possible when it comes to your climb. It is also a good idea to wear the small day pack you will be taking with you on the climb so you feel at ease with it and gradually add weight to the pack to build strength. Being mentally prepared will also be crucial to your chance of a successful summit climb. Progressively pushing the limits of your physical training will help develop your capacity to endure the strain. A positive attitude is also crucial. It is helpful to remind yourself when training and during the climb that thousands of people have achieved this feat before you and that you can do it too. But do be prepared for setbacks and particularly difficult stages during the climb. And remember that your guide will be there to encourage and inspire you! Give yourself enough time to build specific conditioning. It is no good trying to cram everything to the month before you depart. Put training plan together and build on your fitness, conditioning and endurance over time 4 – 6 months (minimum). This will also help you avoid injury and pick an 8 day itinerary. We can help you build a training plan that works for you. Understand the climb and apply to your training. You will need to be training 4 – 5 times a week with heavy weight in your back pack and also doing interval training. Remember you will be walking up and down hills on steep and challenging terrain up to 6 hours most days and 14 hours on the summit attempt. You will need to manage the distances and miles you are walking and getting the specific conditioning for the climb. Make sure you have followed the base, build and peak format for your Kilimanjaro training. Once your training is complete, you will need to Reduce your training before you depart on your trek a week in advance. Get some well-earned rest and start your trip feeling fresh and well hydrated. Don’t ignore nutrition. You need a well-balanced diet to maintain a good level of health. As your routine picks up and you train harder, more strain will be placed on your carbohydrate stores. Before, during and after exercise you will need to supply your body with the fuel it needs! Going on a trip knowing that you are fit,strong and ready gives you one less thing to worry about, it boosts your confidence allowing you to get the most out of the experience. Mix up your training: It’s hard work, I have to drag myself out of bed now and go for a 10km jog. This training has to be done, not every day and not the same training is required everyday. You are training to climb up and down a mountain so your training should be specific to the mountain hiking. If you have access to hills or mountains and you have the time to get out walking up and down them that is great. Hill walking for 3 – 6 hours once a week, and additional gym training will get you mountain fit in no time. This is not always achievable and we can help you prepare based off a gym schedule. 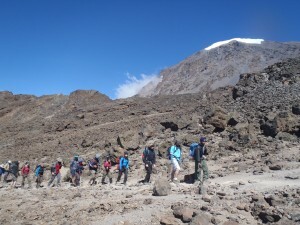 Training for Kilimanjaro is a must and we require you to come prepared for the climb. You have coached your body and muscles to handle more pressure walking up and down hills with extra weight in your backpack. So once you take most of that weight off when you get to Kilimanjaro your body will know how to perform better under pressure. You will have to carry a backpack with 5kg – 7kg on a daily basis going up and down Kilimanjaro so you need to training with twice this weight in all your training sessions. Everyone is individual and there is no one size fits all in your preparation. So specific training as per your current condition would need to be assessed to maximize ones progress and potential. For more information get in contact. Or enlist the service of a personal trainer, conditioning and endurance coach or local gym instructor. My Jog this morning will help and is great training, but walking uphill with weight on my back would be a better option, but no time to get to the hills today I,m afraid. If I can get out once a week with 12kg/ 26lbs back pack, it will make a big difference in my preparation in climbing Kilimanjaro. I am just back from my 16th Summit of Kilimanjaro and one thing that stays the same for me, is you need as much time to acclimatize as possible. We ran a seven day Machame climb and not everyone made it to the summit. The trip reminded me that you need to train with a pack back building up to 8kg – 12kg. Walking in the hills or on up hill terrain as much as possible. For full details on training and advice CONTACT US and we will get you on track. I am just back from my 25th summit of Kilimanjaro and I can not stress enough the need for more acclimatization. I witnessed so many people struggling up the side of Kilimanjaro. Some of the challenges were down to lack of preparation, but most were down to lack of acclimatization. Spend the extra money and give yourself the best chance at success. I highly recommend 8 days on the mountain. Why endure when you can enjoy. This is a once in a lifetime experience. Give yourself the best and most enjoyable time on Kilimanjaro. Shorter days and more enjoyment. I get asked weekly about about how many hours a week and weeks before you climb Kilimanjaro should you be training? In terms of the hours training, that really depends on your current standard of fitness. If you can walk for 10 miles in the hills for 5 – 6 hours with a 10kg/ 22lbs backpack and get up and do it again the follow day and feel good afterwards then you would have good conditioning for Kilimanjaro. If your body is sore that’s OK you just need to adjust your training. In terms of hours training per week, you should be aiming for 8 – 10+ hours per week and making sure you get a fitness test to map out your heart rate zones well in advance. You need to keep your heart rate up and steady for an extended period of time (1 hour +) but not where you can not speak, you need a steady heart rate. Interval training can be added to your routine, once you have your base training done. This should take 2 months. Monday: Walk up hill on a stair master for one hour. Your pace should be based off the proper heart rate training zone for you personally. (Add 5kg or 6kg/ 11lbs or 12lbs to a backpack and build month on month up to 12kg/ 26lbs) Add 2kg / 4lbs per month and build up to 1 hour 30 minutes per day. Tuesday: Jog 5km in 35 minutes and do 45 minutes walking up hill on the treadmill with with 6kg in your back pack to help with leg strength. Heart rates are key here. Build weight and time spent over a 6 month period. Wednesday: Walk up hill on the Stair master for one hour with weight (6kg) on your back. Slowly walking up hill keeping a consistent heart rate, you will be building up to 1 hour 30 minutes. Saturday: Hike in the hills building from 3 – 6 hours with weight in your backpack building from 6kg – 12kg. If you don’t have access to hills there are other ways to gain similar training. We can help you with mapping out this process. No matter where your training begins there are are some keys processes you need to go through. Let’s think about the climb up Kilimanjaro and the different elements involved in preparing for this journey. 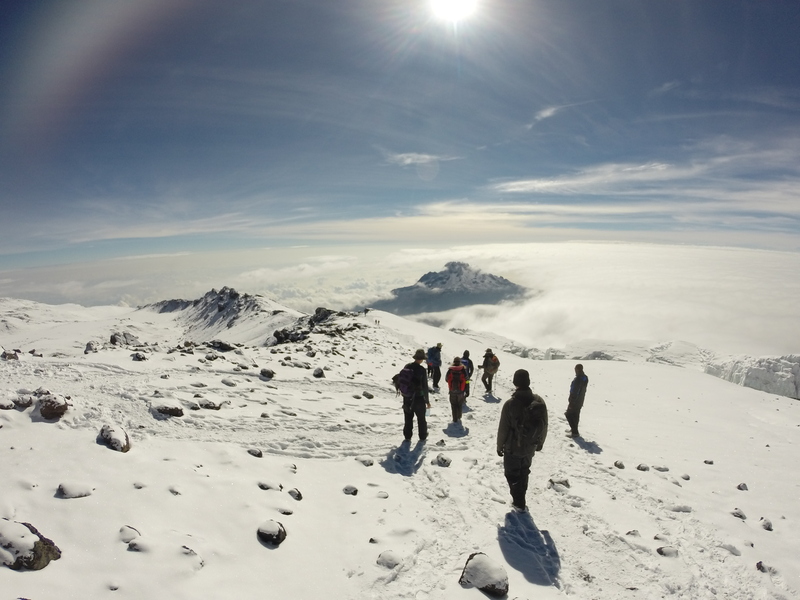 Check out our top 10 tips for our Kilimanjaro climbs. I have climbed Everest to the top, Kilimanjaro 30+ times, Island peak 15 times and lead 30+ treks to Everest base camp. 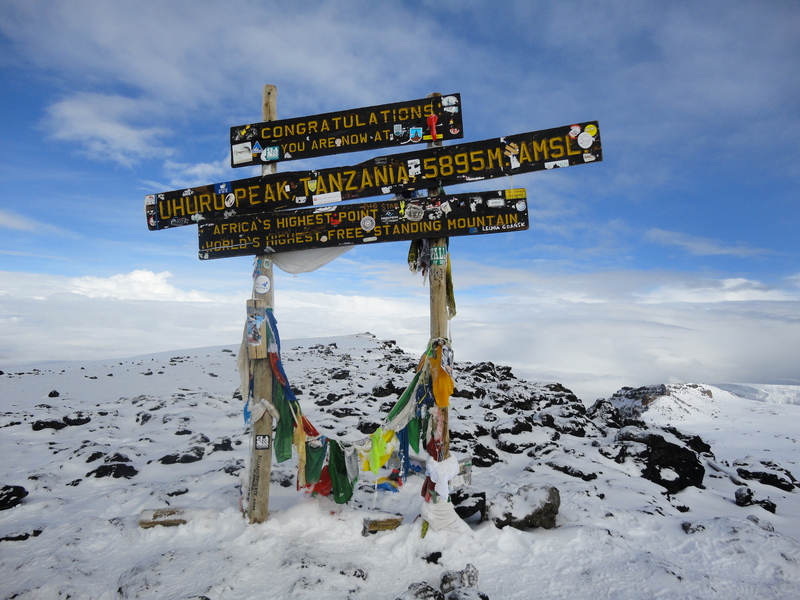 Distance: CLICK HERE and read the daily distances on our Kilimanjaro climbs. Essentially you need to be able to walk 10 miles a day on a multi day basis with a proper back pack with 5kg+/ 11lbs+ with a lack of oxygen. So how do you prepare for this? When you arrive at the Londrossi gate 2,250m/ 7,382ft . You are entering the realm of high altitude with 20% less oxygen running through your blood stream and muscles. You have to walk for 8 days up and down hill to reach the summit of Kilimanjaro at 5,895m/ 19,341 ft. Where there is 50% less oxygen in the air that you are breathing. Then you have to walk down hill to 3,100m/ 10,170ft. which is a 2,795m/ 9,171ft drop down hill to the Mweka camp in the same day. If you want your muscles and body to cover this distance in this environment you need to train and condition your muscles prior to arriving on the slopes of Kilimanjaro. You need to be getting this muscle conditioning or muscle memory in your body, by walking up and down hills prior to your trek. I like to head out once a week walking 3 – 5 hours up and down hills building the weight in my back pack from 8kg to 12kg (11lbs to 26lbs) over a period of time usually 3 to 5 months before my treks. I also add in 3 to 4 other training sessions per week depending on time available. These will range from 6k to 10k jogs, weight training, walking up hill with weight on a treadmill or stair master, bike sessions all using a weighted back pack. The key is getting active and trying to get as much hill work in as possible. I hike at a slow and steady pace trying to drink a liter of water for each hour of exercise. Let us help you prepare as we know most of you are coming from sea level with limited or no access to hills to training on. Altitude: Picking the right itinerary is critical. In our opinion you need to respect altitude and climbing on Kilimanjaro. You need to pick either a 7 or 8 day itinerary to improve you chances at successfully reaching the summit. Even the 7 day itinerary can move too high, too fast some people. 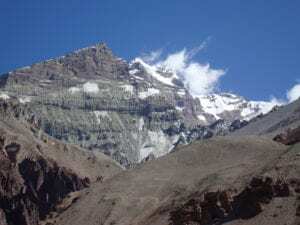 Our 8 day treks have the best acclimatization. IMPORTANT: Read the elevation gains for each day on the Kilimanjaro climb. Any journey going above 5,000m/ 16,404 ft. is dangerous to your health and you need to spend additional time to adapt to the lack of oxygen. Giving your body time to acclimatize to the low levels of oxygen is critical and helps you adapt to the low levels of oxygen. Likewise when you are training for this 7/8 day climb of Kilimanjaro, you need to train in similar terrain where possible. By adding more weight in your back pack at sea level you are making your body work harder and conditioning your muscles for a harder work load when we have a lack of oxygen in the body at high altitude. I hope this makes sense. If not pick up the phone a call us. We can take you through this key training advice for your Kilimanjaro climb. This specific training will help lesson the muscle fatigue at altitude and help your recovery time at altitude so you can get back out on the trail fit and ready for the next day, and day after that. Mutli-day training: Getting multi-day training or hiking prior to your Kilimanjaro climb is really important the closer you get to your trek. You will be walking and on your feet for many hours at a time with 3 liter of water, down jacket or fleece (depending on the day) Rain gear, snacks, camera, medical kit, valuables and sun cream all adding up to 5kg+ If you haven’t been training with this weight, plus additional weight you are going to get sore leg, back, shoulders and generally feel like crap. You need to get out training on a multi-day basis 6 to 8 weeks prior to you trek. 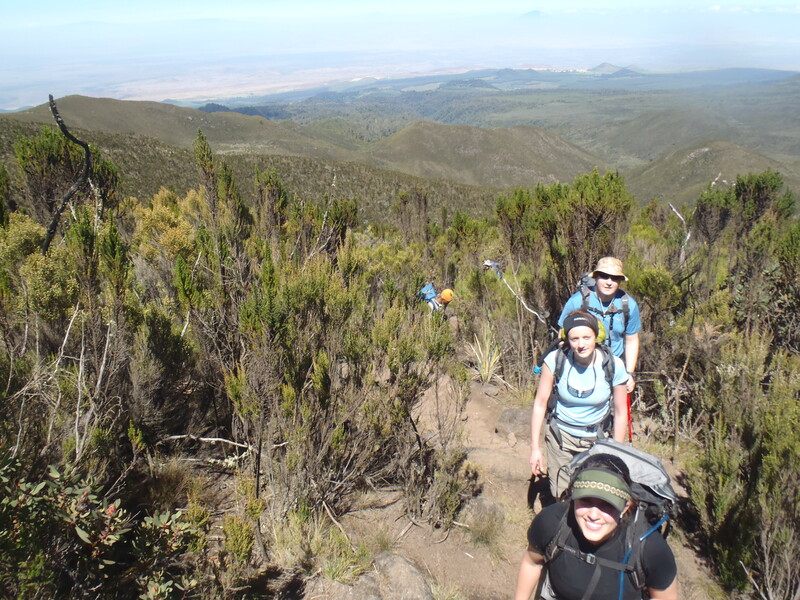 These back to back hikes and training sessions will help your fitness and specific physical conditioning needed to make a safe and enjoyable journey up and down Kilimanjaro. You need to manage your time. You have invested the money to do this climb, you have bought all the gear. You need to consider the group you are trekking with and don’t show up unprepared. I don’t want to have to run you around and send you home because you couldn’t find the time to train. Remember is a potentially life changing journey. You need to respect the mountains, the team you are going with and our team on the ground. So come prepared and make sure you find the time to train and make sure it is the right training. As I always say we are happy to talk you through a specific training plan that will work with your time and the facilities you have available. There is no one size fits all training plan. We need to talk to you individually about the best way you can prepare for your trek. You might be living in Denver, Sydney, Hong Kong or Belfast. Where you live and what facilities you have available to you will determine the training program that will work for you. By starting with easier treks like the Inca Trail, or climbing Mt. Toubkal in Morocco you will build your experience for longer treks to higher altitude. 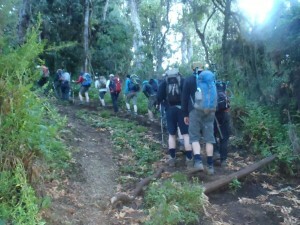 If our Kilimanjaro climb is for you then you need to come prepared. Please don’t show up on one of our treks without having done this prior training. This training advice for Kilimanjaro is tried and tested over the last decade. I have trained numerous people for this climb, climbing Everest and other major peaks. You need to come prepared. Call us, set up a skype call. 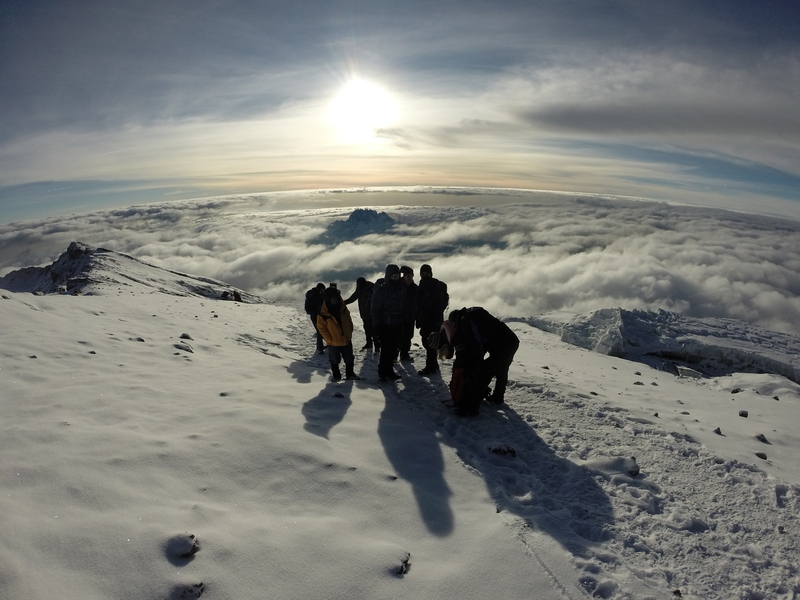 We want to help you prepare fully for your Kilimanjaro adventure. This is a basic schedule for training, some people will not have access to a gym or hills so CONTACT US or CLICK HERE FOR OTHER BLOG POSTS and we can map out a training plan that will work for you. Everyone’s training schedule will be different, just remember that Kilimanjaro is a gradual walk up and down the side of a mountain so emulating the same type of activity / training is going to help. You will be walking for 4 – 6 hours per day with a 13 – 16 hour summit day carrying anywhere from 4kg – 6kg so it is so important to have that weight and more in your back pack for your preparation and training. It’s also worth remembering that that you will be doing this on a multi-day basis so if you can get multi-day hiking in at home prior to your climb of Kilimanjaro this will really help. You want to push yourself in your training before you go to Kilimanjaro. Once you arrive you feel fit, strong, prepared and ready to enjoy the challenge and not be worried about your preparation. GET MOVING!! Getting the right training in for your Kilimanjaro climb is important. It is important to get it right and come with the best preparation possible. Just click below and will get access to professionals who have climbed Kilimanjaro many times.